Massachusetts fishing regulations allow fishing year-round. My season has started as early January at the Swift River, a tailwater fishery that flows off the bottom of Quabbin Reservoir in central Massachusetts. But usually it is not until March or April that my line gets wet. As a lifelong resident of the Western suburbs of Boston, "Opening Day" conjures up images of Fenway Park and the Boston Red Sox, not fishing. That is because since the late 1970s, Massachusetts has been one of those lucky states with no opening day. Fly-fishing can be a year-round activity! But every year I do have a "personal" Opening Day. This year’s goal was to get on (in!) the water as soon as possible in March. Early on, because of the winter draught, I thought a March outing would be a reasonable expectation. But in addition to a lack of snow, New England suffered some record cold weather. Each weekend in March I just shook my head, put another log in the woodstove, and tied a few more flies. Then came the wettest April ever recorded in Boston. I don’t mind fishing in the rain, but there is something about the phrase "flood waters" that puts a damper on things. But finally, on the last Sunday of the month, the stars were all aligned. The water level on the Nissitissit was reported by a friend to be reasonable. So I took the plunge. I threw everything into the back of the van and headed north. I am a big fan of mini-vans. This is my second. storing stuff and eating lunch. The Nissi looked promising. The river was indeed wadeable, the water temperature was in the low 50s, and the air temperature was in the 60s. A winning combination for my personal Opening Day. The Nissitissit offers some fine early season fishing. 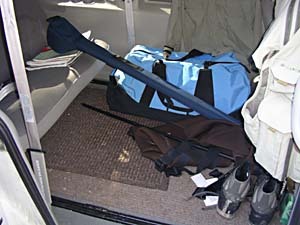 The picture above is along the Fly Fishing Only section. 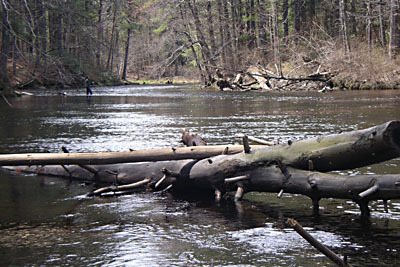 Looking upstream, one fisherman on the left is standing in a riffle that empties into a deep pool on the near side of the river. A similar riffle/pool combination lays just upstream from him. It is in that uppermost section that I spent my first hour of the season, and where my friend Alberto had caught a fat stocked rainbow and a 16-inch brightly colored (holdover?) 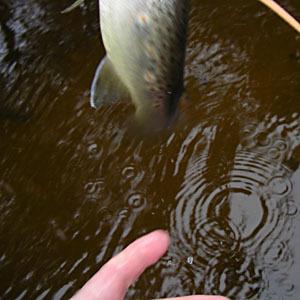 brown trout between rainstorms the previous week. With a 5W sink-tip line and a short leader I chucked lead-weighted flies and heavy beadheads into the riffle and pool, but failed to repeat Alberto’s success. Having struck out, I got out of the water and walked downstream to a sandy bank where I sat down to warm up a bit in the sun. The water was moving fast but the surface was smooth due to a bottom of sand and small black rocks. While I stared at a few mayflies flying a few feet off the water, with complete surprise I heard a fish slash at something quite noisily near the far bank. After I located the ripples I heard another loud noise one long-cast-away downstream. With hands trembling at the thought of catching the season’s first trout, I dug into my vest and pulled out my floating line, a new Cortland peach 444, and stung it up being careful to enter the line through each eye. I knew the leader was in good shape because the prior evening I put new ones on each of my lines. I was pleased that I had had the foresight to attach two feet of 5x tippet. I had been so busy getting my line rigged-up that I hadn’t done much insect-watching. I had seen some size 12 gray mayflies (that’s the limit of my entomology terminology). On the other hand, the violent slashing and sounds of the trout attacking insects was a hint of caddis, although I did not see any. So, I put on my standby, a size 12 Hare & Herl Bugger. I thought I might pick up a fish by swinging it below the surface like a larger emerging insect. In a few casts I had my first of six 10"-12" brownies. Click here for step-by-step instructions of a favorite of mine, the Hare & Herl Bugger. Whoops... slippery...I was hoping to get a good picture of my first trout of the season! By now I had actually seen a few caddis, size 14 in gray/tan clothing, skimming across the surface. 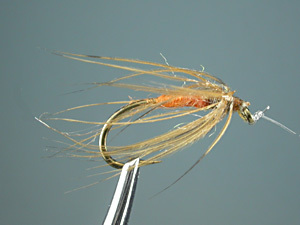 I took the weighted bugger off the tippet and tied on a size 10 orange soft-hackle. Though not of the same color as the naturals, orange is a great attractor color. I hoped that a downstream swing of this fly near the surface would entice a fish or two. Because there is no tail on this classic soft hackle pattern, in my opinion you can use a slightly bigger hook without making the fly too long. Casting down-and-across near and between several sunken logs in the area of the rises, I picked up two more browns in short order. 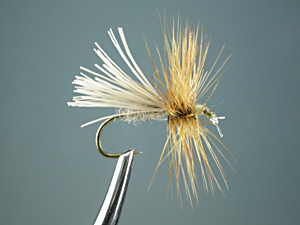 This image is of the actual fly used, complete with a bit of snipped tippet. I feel rather inadequate as a dry fly guy, but figured I had caught opening day fish already, so why not give a dry fly a try? After all, my dry fly box was overstuffed after a winter of tying. 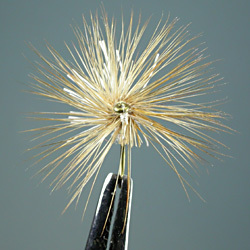 A size 14 deer hair caddis looked to be the right size, though the ginger hackle I had used on this series and the bleached deer hair created a brighter appearance than the naturals I was seeing. Yet, I am also a believer that presentation, shape and size are more important than color. This is the actual fly. No worse for wear after three trout. I have had success with this style of caddis before, and it worked on this day as well. I managed to bring to hand two more browns with upstream and across casts. And the final brown of the afternoon fell to this fly at the end of its drift, after I tugged it underwater and gently swept it across the current. Frontal view: A bit asymetrical, but I guess the fish didn't notice. Within an hour of the start of this flurry of activity, the wind picked up and all insects seemed to disappear. I saw no more fish and the breeze began to chill my bones. It was time to go home after a short fishing day. But I had singles and doubles with my fly selection and I was all smiles. 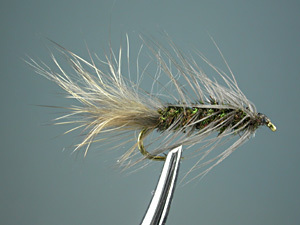 A note about the Deer Hair Caddis shown above: The wing on this version is tied in by the hair tips, not the butts. That explains the blunt ends you see in the photo. This is not an original idea. Readers of The Fly Tier’s Benchside Reference (Copyright in 1998 by Ted Leeson and Jim Schollmeyer) will find this technique described on pages 312-313. Perhaps not appealing to the eye of the fisherman, this tying technique results in less build-up at the tie-in point because the deer hair tips are thin. Also, the more buoyant part of the hair (the hollow end) is at the rear of the fly, where it can help support the heavy end of the hook. Scissors are used to trim the wing to the desired length and an appropriate shape.